The cultural town of Zhoupu in the Pudong New Area will be the site of the Asian branch of the Spanish Queen's Sophia Children's Art Museum. 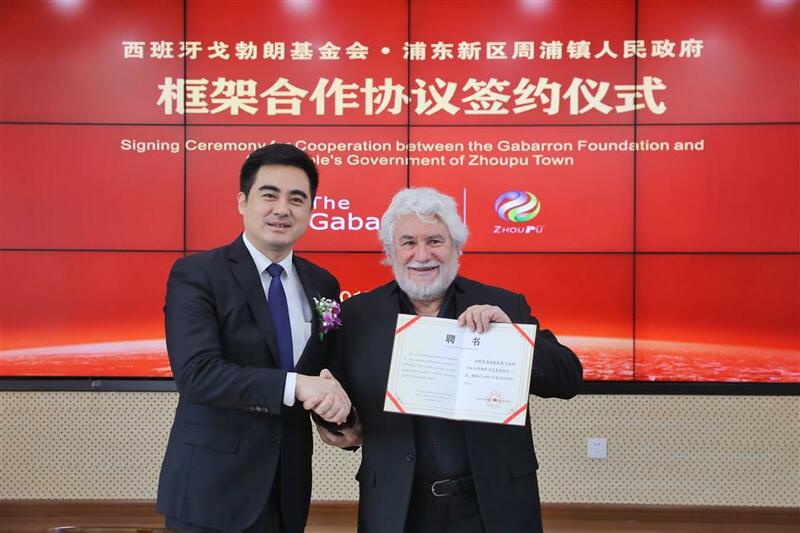 Cristobal Gabarron receives a letter of appointment from Wang Hongzhou, head of Pudong’s publicity department. The Spanish contemporary artist has been engaged as a cultural and artistic advisor of Zhoupu Town. The cultural town of Zhoupu in the Pudong New Area has been chosen as the host of the Asian branch of the Spanish Queen's Sophia Children’s Art Museum. The museum, earmarked to be built in a renovated factory at 4399 Shenmei Road, will cover about 5,000 square meters. It is set to open to the public by the end of next year, according to the township government. Spain’s Gabarron Foundation, which created the museum in Spain, will provide exhibits for free for the local branch. Together with the township government, the foundation will also hold a series of global cultural activities for children, from drawing competition to art lectures. Zhoupu boasts a history of more than 1,300 years. It is the hometown of renowned calligrapher and painter Wang Yiting and writer and translator Fu Lei. Not surprisingly, therefore “discovering a century-old house tucked away in a crowded street is not so infrequent an occurence in Zhoupu. We should preserve our relics and also introduce more cultural cooperation with foreign institutes," Li said. The Gabarron Foundation was set up by Spanish contemporary artist Cristobal Gabarron in 1992. The children's art museum in Zhoupu is part of the cultural cooperation between the foundation and the township government.